Heat oven to 375°F. 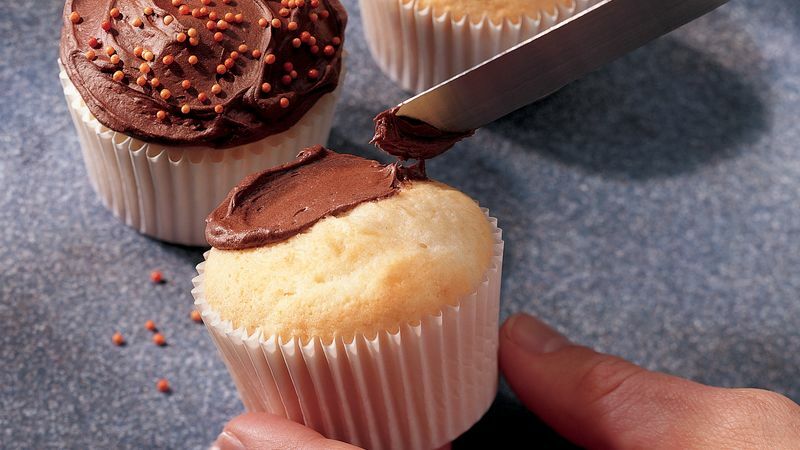 Place paper baking cup in each of 24 regular-size muffin cups, or grease and flour muffin cups. Beat all ingredients except Frosting in large bowl on low speed 30 seconds, scraping bowl constantly. Beat on medium speed 4 minutes, scraping bowl occasionally. Fill muffin cups about 1/2 full. Bake about 15 minutes or until toothpick inserted in center comes out clean. Immediately remove from pan; cool. Frost. If only one 12-cup muffin pan is available, refrigerate the remaining batter while baking the first 12 cupcakes. For a quick and fluffy frosting, stir a little caramel topping into whipped topping. Decorate with chopped peanuts or miniature chocolate chips. Stir 1/4 cup miniature chocolate chips into the cupcake batter for chocolate chip cupcakes. Stir a drop or two of mint extract into your favorite frosting. No time to frost? Simply dust these sweet treats with baking cocoa. Or sprinkle with chocolate chips before baking.